Join us in chapel today for Interfaith Chapel with Jaylani Hussein, Executive Director, Council for American-Islamic Relations of Minnesota. Last week, Augsburg welcomed more than 200 attendees to the first annual Celebration of Philanthropy event. In this interactive event, guests connected with each other, had their photo taken with Auggie Eagle, told us why they support Augsburg in the video booth and on a large display board, and met student researchers. The evening concluded with dessert and discussion and the presentation of a video showing how Auggies and donors are changing the world. 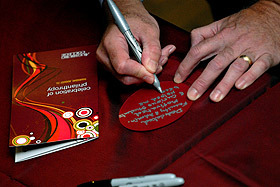 This event is the first in a series of donor recognition events that will be held in the 2011-12 academic year. The next event will be a holiday dinner hosted by Paul and Abigail Pribbenow in conjunction with Advent Vespers in December, followed by the annual scholarship brunch in April. The series also includes a September boat cruise on Lake Minnetonka for young alumni donors and a celebration of student philanthropic achievement with a class party in April for the class that wins the "Feed the Pig" contest. These invitation-only events are designed to recognize the many levels of giving from alumni, friends of Augsburg, and current faculty, staff, and students. Thank you to all our donors! You truly are helping Auggies change the world. More information about upcoming Celebrating Philanthropy events. See photos from the Celebration of Philanthropy event. Watch the video about Auggies changing the world.